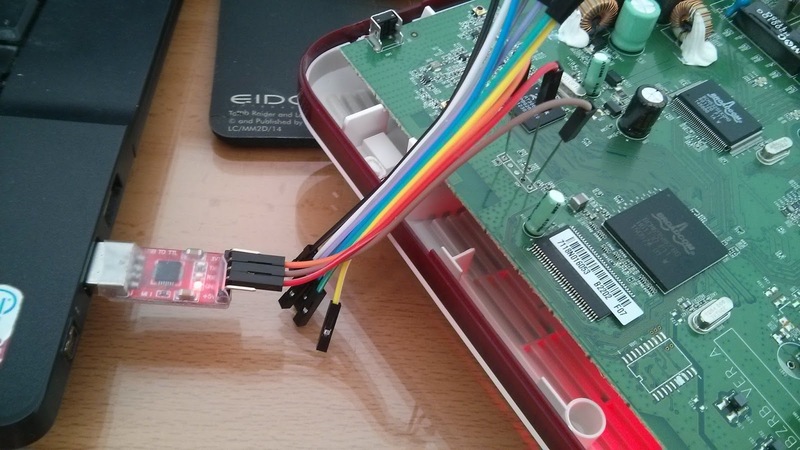 Last week, we talk about how to find out the UART connections of an Orange router with a multimeter for getting root access to the device. We identified the pinout (GND, RX and TX pins) last week but today we are going to see how to connect the USB-to-UART converter and how to find out the baud rate easily for getting the booting process and accessing the root console. However, I have another broadband router this time to have fun, a Huawei EchoLife HG556a, which is an interesting device for my lab. We can see that some of the pins have lines meaning they are making contact with the PCB. For instance, it's easy to see that the forth pin doesn't have lines meaning it useless. 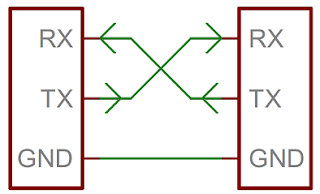 What's more, the second one has four lines meaining is a power pin, either GND or Vcc. Finally, all other pins have a single line meaning they are TX, RX or Vcc. This trick is a little bit risky because we can break our device but if we don't have the right tools we can use this trick connecting each pin in turn to find out the pinout. Once we know the pinout, we have to connect the USB-to-UART converter to the router. First, we should connect the GND pin between each other. 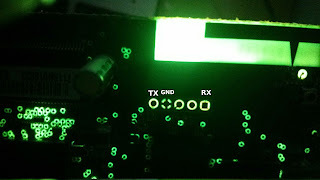 Second, I would connect the TX pin of the router to the RX pin of the converter and, in this time, we should be able to see the booting process but not stop it or send or write something. At the end, I would connect the RX pin of the router to the TX pin of the converter and, in this time, we should be able to send information to the router like, for instance, username and password for getting root access. We already know the pinout and how to connect the converter to the router but, maybe, we don't see any information yet through our miniterm/minicom application. This is because we have to configure the baud rate properly but, first, we should know what baud rate configuration we have to set. 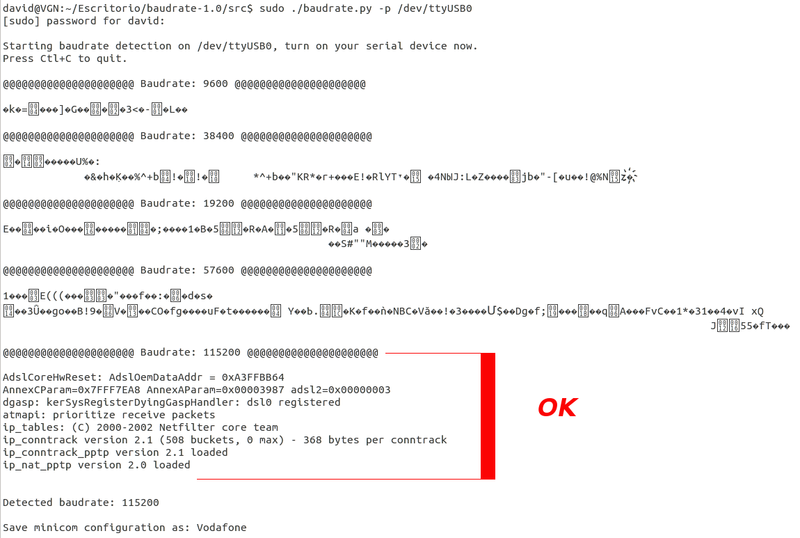 The best way to find out the baud rate configuration of an unknown serial device is with the Baudrate tool developed by Craig Heffner. 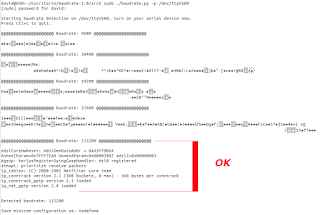 Next, we can see that the tool allow us to change the baud rate configuration of our host system's serial por on the fly and with 115200 of baud rate we can read the output (letters) properly. If we have got the baud rate configuration, we'll be able to see the booting process, and even stopping the autoboot process, and finally we'll see the console prompt to have root access. Regards my friends, are you ready for doing whatever you want in your router?